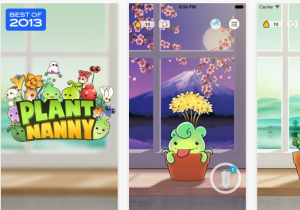 This free water drinking reminder app called “Plant Nanny” is only available on the App Store for iOS devices. It’s fun and simple to use. Track your water by “watering your plants” and growing your garden! (Think cha cha cha chia!) Change your settings to your personal fluid intake goal and the size of you water bottle. The app will tell you how many bottles you need to reach your goal and will remind you to drink (but not in an annoying way). If you don’t drink for a while, your plant looks very sad and starts drooping over! Keep it watered and it grows quickly and is a happy little guy. Your plant grows and becomes more healthy as you do!